Sadly, he probably won't wear the cape today. Stephen Colbert is in town today, and he's tweeting up a storm about it to ensure that everyone in the free world (and/or the District) heads out to see him today at 4 p.m. "Wear a carnation so I know it's you," he instructs. 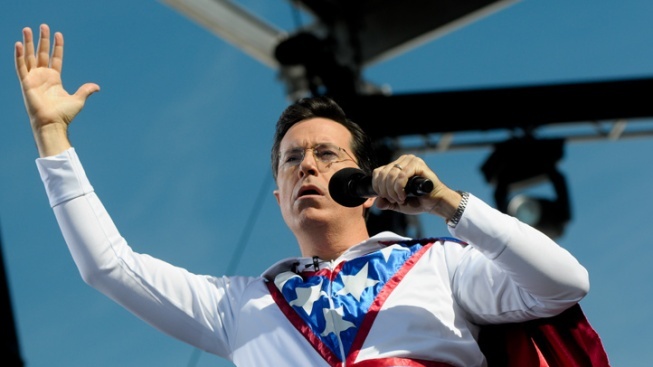 Colbert is in town to file an exemption to be able to discuss his SuperPAC on his show, which means he'll be at the Federal Election Commission (999 E St. N.W.) -- as evidenced, again, by his very needy Tweeting. "Money = speech. So come give me a lot of your speech. 4pm at the FEC," he wrote. First, Colbert was told [that his] PAC ran up against corporate "in-kind donation" rules by discussing it on his Viacom-owned show. Fortunately his "personal lawyer" (former FEC Chairman Trevor Potter) helped show him a loophole where all he needed to do was change it to a SuperPAC by writing the word "Super" on the cover letter. Then, this week, he was told by Viacom lawyers that he could no longer legally speak about his SuperPAC on air. Potter came to the rescue again by telling him about the "media exemption" that the many PAC-holders on Fox News have, that claims they are just "reporting the news." So, once Colbert gets the exemption, he should be able to talk about and support as many candidates and issues as he wants. CityStream.com cites a recent Supreme Court decision that allows for unlimited corporate donations to PACs as the impetus behind Colbert's dastardly and/or brilliant scheme. Oh, and it's also his birthday today, so you should probably just do what he wants. Just don't forget the carnation.